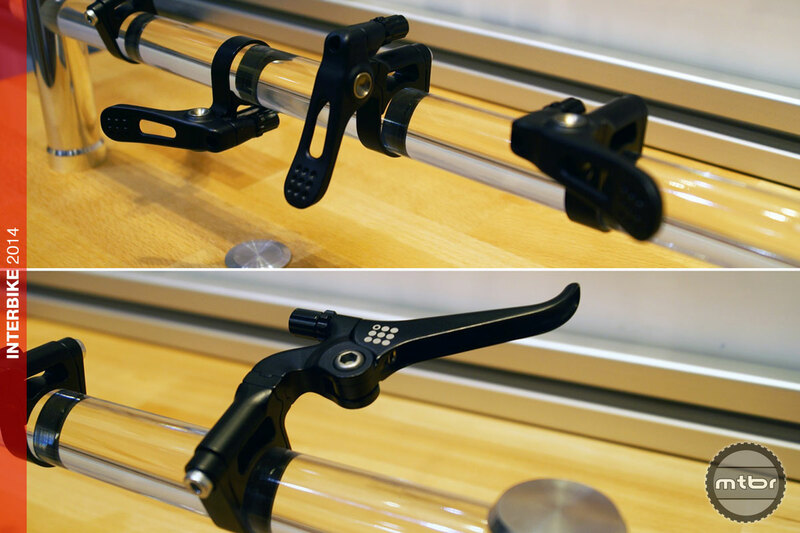 Canadian manufacturer 9point8 showed off their new $325 Fall Line infinitely adjustable dropper seatpost at small stand in Interbike’s out-of-the-way incubator known as “The Lab.” The Canadian-made post comes with 100 or 125mm of drop and in 30.9 and 31.6mm seatpost diameters. Available only for bikes with internal cable routing, the unit uses a derailleur cable that actuates with either 9point8’s clever ThumB three-position lever, or their optional mini brake lever-like Trigger remote. 9point8’s clever ThumB remote (top) can be set up under-bar, over-bar, or next to the grip. 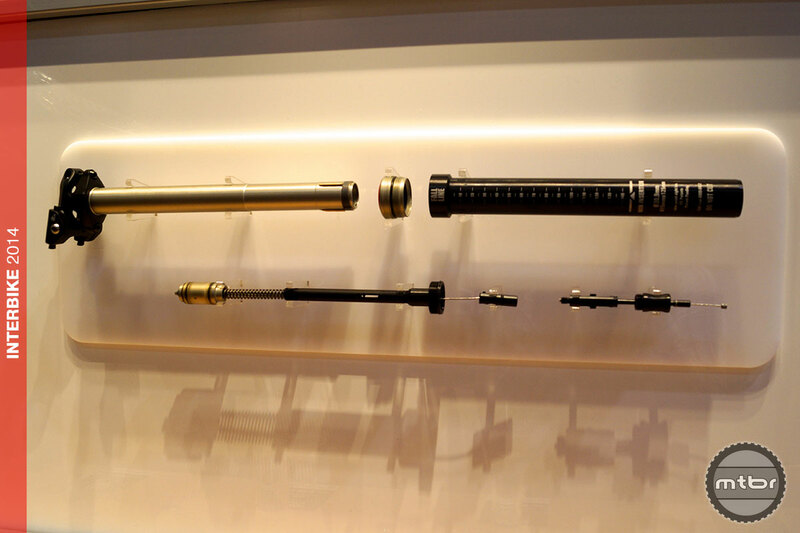 They also offer a brake lever-like actuator (bottom). We suspect either $35 option would work well with other cable-actuated dropper posts too. As you might expect, the demonstrator Fall Line exhibited smooth movement, crisp operation and exhibited no side-to-side play. As with all dropper posts, the real proof comes after a few months of use. Given the track record of 9point8’s other post—the $450 Pulse, which we tested last year—we have high hopes. It should be noted the Fall Line lacks the “stepped” intervals of the Pulse which can be clicked down in 5mm increments—a love-it-or-hate-it feature that likely accounts for much of the cost difference. 9point8’s clamp head (right) looks solid and well constructed, and we appreciate the inclusion of a simple but effective torque key (bottom left). Like the Pulse, the Fall Line will be available in early 2015 and comes with either a zero- or 25mm offset saddle clamp which can be converted from one to the other should you change bikes. 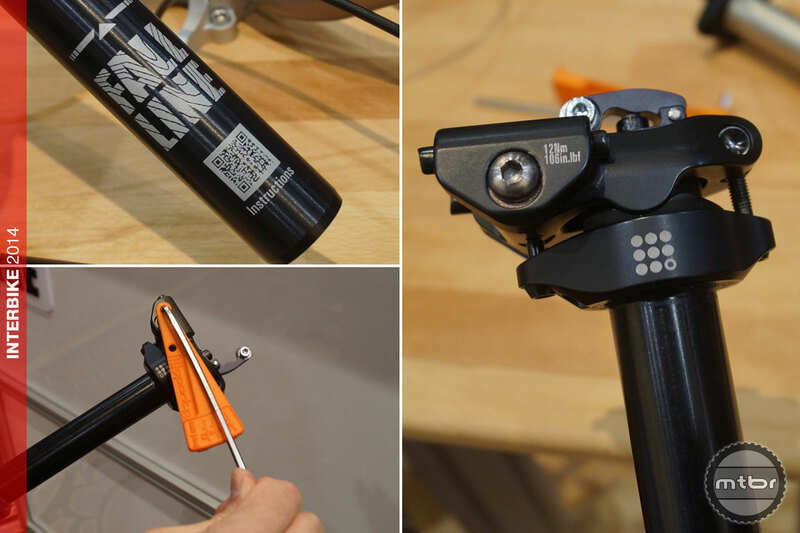 Because the Fall Line has specific (and different) torque specs for both the seatpost collar and saddle installation, 9point8 includes a handy torque wrench which should prevent performance-detracting hamfisting. Finally, the company is so confident in their quality and craftsmanship that all 9point8 products come with a lifetime warranty.